What do you think of when you think of Deep Ellum? Is it the bar scene? The concert venues? The tattoo parlors? If you are like most Dallas residents, you most likely think of one of those options when you think of that stretch of town just East of our skyscrapers but before Fair Park. One thing that most people don’t think of when they think of Deep Ellum is the food scene. From an area of town that up until a few years ago was all but forgotten by most folks, Deep Ellum is now truly a destination within this great city of ours. Yes, Deep Ellum still has all of those aspects for which people labeled it so long ago. You can see your favorite band, pound a few cold beers and even go get that tattoo you’ve always wanted, but thanks to the so-called revival that local business owners have put into the area, you can now enjoy so much more. 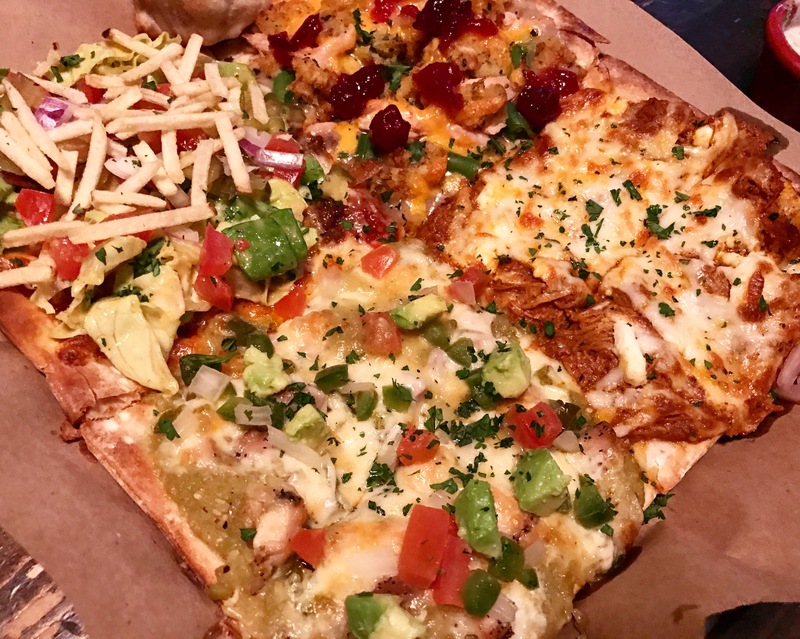 One of those places to enjoy is Stonedeck Pizza Pub. 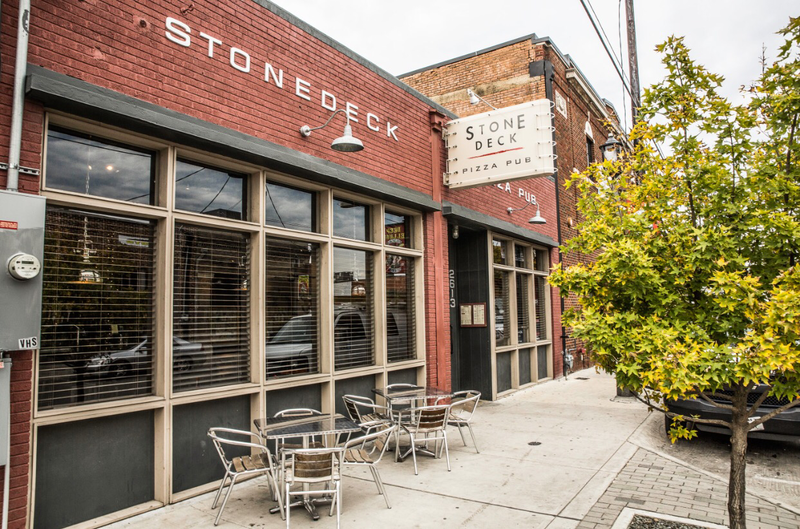 Located right in the heart of Deep Ellum, on the corner of Elm and Good Latimer, Stonedeck offers up incredibly creative food from scratch that is affordable, delicious and accessible to everybody. A few weeks ago I was invited into Stonedeck to experience it for the first time. YES, I realize it has been there for some time now but I’m SORRRYYYYY!!! There needs to be more hours in the day, what can I say? Let me start by saying WHOA. Everything about my experience was so much more than I could have ever expected. 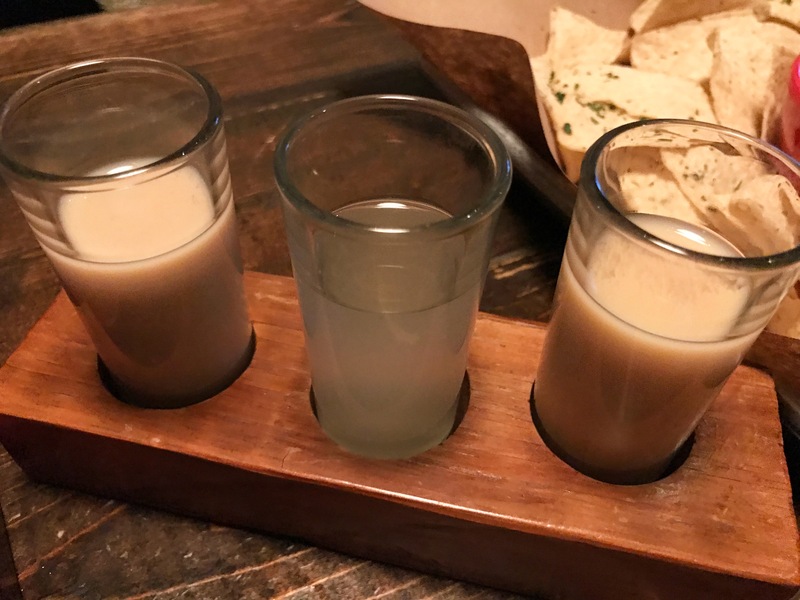 The staff was insanely friendly, the vibe was eclectic but cool, the patio is a hidden gem, they infuse their own moonshines AND you can get a pizza flight if you can’t decide on which of their selections to order individually. Mmmhhmmm. Do I even need to go on? Something that I didn’t realize before my visit was just how much booze plays a role in the vision here at Stonedeck. 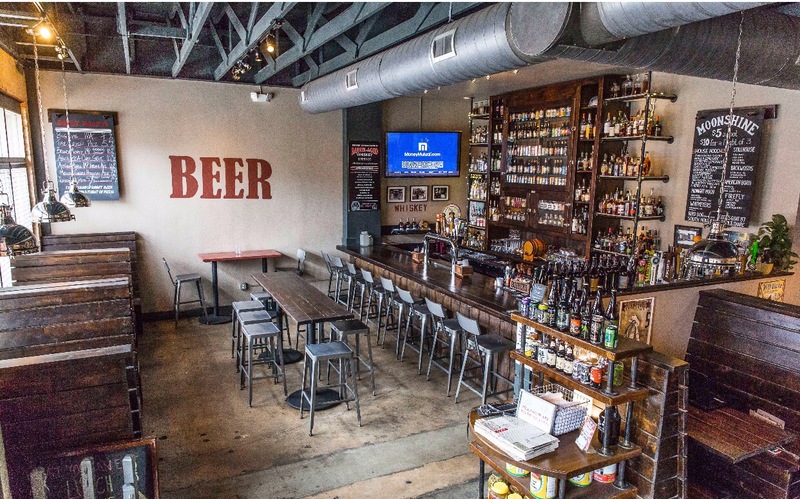 They carry over 125 American craft beers with an emphasis on sharing the love of local breweries! Moonshine is also a huge part of the Stonedeck menu. They feature over 25 craft distilled moonshines and at any given time are infusing close to a dozen of their own. On my particular visit, I tried the Blueberry Pancake, Ginger Lemon, and Pumpkin Spice house-infused moonshines and let me just tell you, I’m converted. By no means am I usually a moonshine drinker. Let’s just say I had a few rather..rough..experiences with it back in high school and always wrote it off as a HELL NAH beverage of choice. The moonshine here at Stonedeck isn’t what you’d expect. The flavors are powerful but they go down smoother than any raw alcohol that I’ve ever had. For the holiday season, they’re even doing a Cocoa-Candy Cane (available until 12/15) and an Eggnog moonshine (available 12/15-12/31). I HIGHLY recommend that you try them out for yourselves. Now, aside from pizza, I am a firm believer that all pizza joints should crank out one of two other items: either garlic knots or pinwheels. In the case of Stonedeck, they serve up some seriously killer pinwheels. 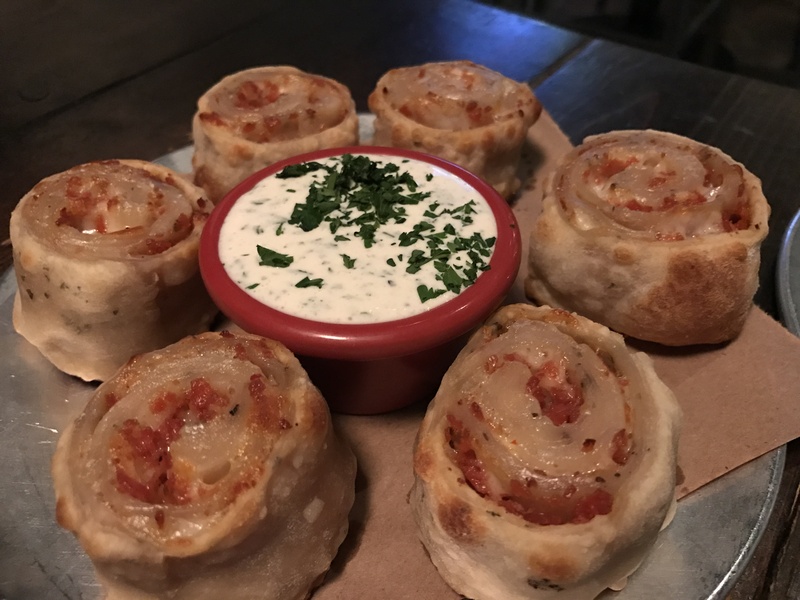 Accompanied with their house-made ranch dressing that I could drink with a straw, these pinwheels are ooey-gooey, cheesy, crusty wheels of perfection. 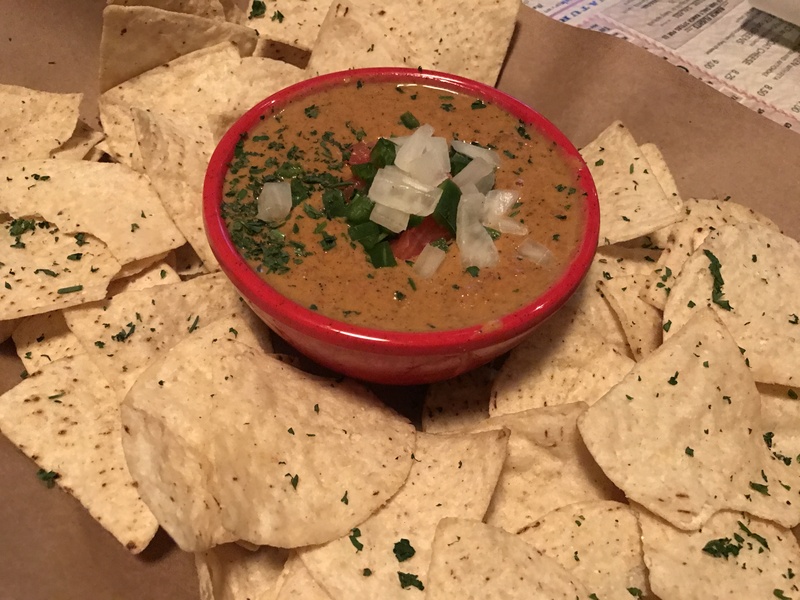 Another surprising thing I learned during my visit to Stonedeck was that their queso is INSANE. Seriously, it is arguably one of the best quesos in town, in my opinion. It’s ultra rich and comforting and comes with a trough of tortilla chips, which, obviously, I am so down with. Last but certainly not least, the pizza. Oh, how I love the pizza. Part of me is really annoyed at myself for not thinking of the genius idea of a pizza flight, but the other part of me knows that I could never in a million years make it as good as Stonedeck does anyway, so I would rather pay for perfection. Let me start by saying, you don’t have to get a pizza flight. You are kind of crazy not to, but they have a whole slew of pies that they’ve created that you can certainly choose from or you can create your own. However, the pizza flight option is where it is at! You can choose four pizza combos and they will all come out on ONE pie. Have a big party or are just extra hungry? Hey, no judgment here! Stonedeck offers a megaflight, where you can select 8 combos for the ultimate pizza flight experience. Is your mouth-watering yet? Mine is! If you do nothing else over the next few days, take this advice, GO EAT AT STONEDECK. I can guarantee you’ll have a great time and leave just as pleasantly surprised as I did! Who knows, I might even see you there!